The family arrive, noisily, on my doorstep. Faris the Rascal is wearing a rabbit headdress, manufactured in Reception Class and is carefully carrying my present, a decorated basket (also hand-made) containing several fluffy yellow chicks and a rather squashed Kinder Surprise Egg. The Twinkles, Tala and Lilia, are desperate to show me their new sparkly shoes, complete with lights which flash when they stamp their feet. Team Baldwin have arms outstretched ready for hugs; the Middle and the Youngest of the Darling Daughters also need greeting, laden as they are with carrier bags containing the wherewithal for our dinner. Me - well, I’m on the telephone to 111 trying to sort out an unholy mix-up between hospital, GP and local pharmacy over Mr B’s medication. I can’t imagine what the operator at the other end of the line makes of my garbled conversation, muddled as it was with effusive greetings for my oh-so-welcome visitors. I have spread fleeces over the hospital bed and adorned it with pillows and cushions so that it will look less like a bed and more like an invitingly comfortable sofa. Out in the garden, the Easter Trail is set. 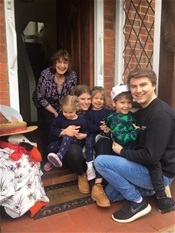 On the doorstep, the Giant Penguin wearing one of my blouses, a red ribbon neckerchief and Mr B’s battered straw hat, decorated with cardboard bunny ears. Had it not been for the Problem of the Pills, I would have been all ready and waiting. We have two Easter Trails. As you would doubtless expect me to say, why have one Easter Trail when you could have two? I have the rather whimsical idea that, having enjoyed following their own Trail and discovering their chocolate rabbits, secreted in a storage box down among the daffodils, the Trio of Rampaging Rascals should then set a Trail for their two grown-up cousins. In my admittedly fanciful head, this will show them that giving and receiving pleasure can be measured in equal amounts. Yes, I told you it was fanciful. Only, two members of the Trio appear unsure that Jack and Hazel will understand the idea of following the Trail; Faris and Tala run ahead to find the eggs they have previously hidden, bearing them back triumphantly to their cousins. Every time their mother replaces the eggs, off they trot again to recover them and deliver them to their intended recipients - just in case their cousins haven’t worked out what to do for themselves. The whole hilarious episode has been recorded on camera by the Youngest of the Darling Daughters - though, playing it back, I can see poor Jack desperately trying to get his mother to stop filming. Just because his Nan has come up with another of her Totally Embarrassing Ideas, doesn’t mean it should be recorded for posterity. We take a trip to the park at Field Place before dinner. Oh, the swings! The slides! The roundabout! Field Place is one of Worthing’s hidden secrets, and the venue for two very special family occasions. I remind Hazel of the Ruby Wedding party, almost twelve years ago, where she and cousins Katie and Eleanor, in their white bridesmaids dresses, ran barefoot across the bowling green as the dusk was falling, for all the world like fairies dancing in the gloaming. At home while dinner is being prepared, Jack attempts to explain to me what a cytoskeleton is, with a little bit of help from some useful YouTube videos. I am an attentive, but somewhat mixed-up student, he is a patient teacher. We agree that it is hard to get really excited about cytoskeletons - unless, that is, somebody out there can prove us wrong. Hazel and I have a chat about Little Women, the latest book she has been reading; I find I am far more informed on the life and times of the March Family than I am on the make-up of cytoskeletons. This is hardly surprising. Everybody agrees that Mr B looks so very much better since he came out of hospital. Mr B accepts what is said without comment - he is still hankering after a cigarette having been deprived of the Evil Weed both in hospital and, more recently, at home. I have told him that he is well on the way to becoming one of those endlessly irritating, self-righteous ex-smokers who will be able to start off every conversation saying: “If I can give up smoking, after 61 years…” Mr B remains singularly unconvinced. Hazel gives him an extra hug on leaving and tells him how very proud of him she is. Suddenly, everyone has departed for home, the Trio already in their pyjamas, Team Baldwin trying to decide whether to spend the remainder of the evening at home or out with friends they haven’t seen since the last holiday. Both Darling Daughters send me photographs when they arrive home, so that I can relive our Easter she-Nanni-gans. And laugh all over again at the antics of my Very Special Family.